KATHMANDU, July 16: Nepal is likely to lose 26 million dollars in US aid money for family planning for this upcoming year. This comes as a consequence of US President Donald Trump's January decision to re-impose the so-called global gag rule which cuts the funding to non-governmental organizations (NGO's) that provide abortion counseling or advocate for the right to an abortion. President Trump has since expanded the scope of this original order twice: First, in April when the administration blocked funding for the United Nations Population Fund (UNFPA). Second in May when the rule was broadened, barring funding to any organization that promises not to "promote abortion as a method of family planning." Worldwide, this has frozen US$ 8.8 billion worth of aid, up from the US$ 575 million affected during the George W Bush administration--the last time the rule was put into effect. As both a poor country dependent on US foreign aid and with legalized abortion, Nepal appears positioned to be severely impacted with the consequences far-reaching. Under the provision released in May, if an NGO were to be running, for example, a well-digging project while concurrently managing a clinic that provide abortion counseling, even the funding for the well-digging project would be jeopardized. "With the global gag rule, Donald Trump is bringing the war to women, globally," said Heather Barr, a senior researcher in the women's rights division at Human Rights Watch. "Women will still get abortions but this sends a message they aren't in control." Barr explained that "in Nepal, what's dangerous is that [healthcare] is so inaccessible. People often only have access to only one provider." In the coming years, many now face the prospect of losing access to their only local medical care. Giulia Vallese, the UNFPA representative in Nepal, voiced concerns about how a loss of funding would affect their ability to react in a crises and rollback some of the progress that has been made in providing family planning throughout Nepal. "Our unearmarked resources have been reduced this year, hampering our ability to respond flexibly and swiftly to changing priorities within our mandated areas" and "USAID [the primary US agency charged with the distribution of foreign aid] has also been a key player in areas such as family planning in Nepal, a funding cut to their health program will affect the overall progress in the country." Vallese also predicted that "this may result in more women and girls having an unmet need for family planning with a likely increase in unwanted pregnancies and unsafe abortions." An employee at an NGO speaking on condition of anonymity said that services in Nepal are already beginning to experience its impact. For example, the NGO at which she is employed, has already suspended education programs about contraception aimed at youths as well as other orientation programs at schools and for foreign workers. Looking into the future, her worry is that the flow of contraceptive products into, especially the isolated Himalayan regions, will be affected as money designated for logistics is cut. 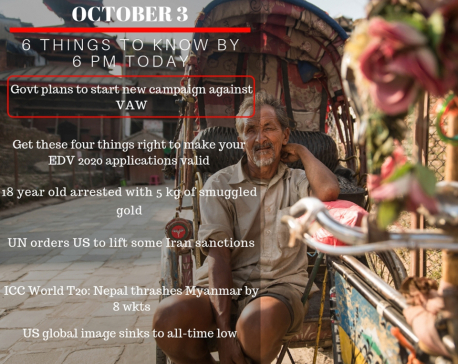 The full effect of the gag rule in Nepal still remains unknown. Contracts with USAID signed before the rule was re-imposed, during the Obama administration, remain funded. However, when these contracts expire and cannot be extended, due to the gag rule, this would, according to that same unnamed employee, "cripple the health sector [which is] dependent on foreign aid." "We are currently assessing the effect of global gag rule in Nepal and unable to make any comments at this point," Avinashi Paudel, communication coordinator at the Center for Reproductive Rights, wrote in an email to Republica. Mahima S Malla, executive director of the Family Planning Association of Nepal, tried to strike a more optimistic tone. She was clear that "our work is still going on" and that "we have other donors" that will be leaned upon, namely in Europe, while Trump remains in office. Malla also added that "we've dealt with this before," during the last Republican presidency. Still, the fact remains, the breath of this new rule is unprecedented, putting at risk the access to safe, affordable contraceptive care to some of the most vulnerable Nepalis. 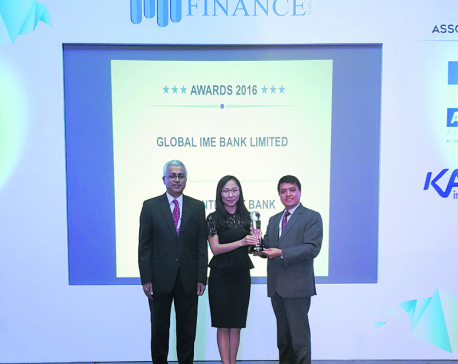 KATHMANDU, Dec 19: Global IME Bank Ltd has received the ‘Best Internet Bank 2016-Nepal’ provided by the International Finance Magazine.